Markets on winning spree. The bull run continued for the sixth straight session on Wednesday on Dalal Street led by commodity stocks following recovery in crude prices while metal shares surges amid value buying. Mumbai: The bull run continued for the sixth straight session on Wednesday on Dalal Street led by commodity stocks following recovery in crude prices while metal shares surges amid value buying. Sensex closed up 103 points at 27,036, and Nifty ended up 25 points at 8,177. 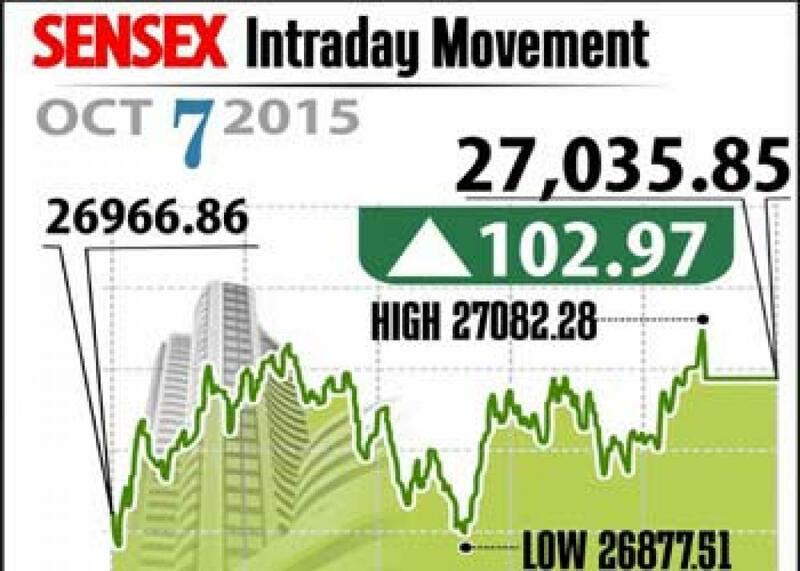 The broader market performed on par with the index shares as midcap and smallcap ended up 0.1 to 0.4 per cent each. Meanwhile, Indian rupee extended gains hitting Rs 65 mark in the intra-day trading against US dollar following the perceived weakness in the dollar overseas. On the sectoral front, the metal index gained following by realty, auto, oil and gas indices, while IT index was the loser. From metals counter, Hindalco gained 9.6 per cent, Vedanta increased 6 per cent and Tata Steel closed 4 per cent higher. From auto pack, Tata Motors, Bajaj Auto, M&M and Hero MotoCorp closed up to 2 per cent each. Also sugar stock traded higher for the second straight day after commodity prices have jumped 24 per cent. The shares of Dhampur Sugars, Shree Renuka Sugars, Bajaj Hindustan Sugar, Balrampur Chini, Sakthi Sugars, Almia Bharat Sugar closed higher between 5 per cent to 15 per cent. Other shares which closed higher include Granules India up 3 per cent, HMT jumped 19 per cent, Sun Pharma up 1.8 per cent, while ICICI Bank closed flat. The gainers: Hindalco Industries, up 9.64 per cent at Rs 81.90; Vedanta, up 5.83 per cent at Rs 90.70; Tata Steel, up 4.25 per cent at Rs 236.80; ONGC, up 3.99 per cent at Rs 256.90; and Bajaj Auto, up 3.14 per cent at Rs 2,452.30. The losers: Axis Bank down 1.92 per cent at Rs 496.90; Infosys, down 1.88 per cent at Rs 1,133.15; Wipro, down 1.78 per cent at Rs 589.10; Bharti Airtel, down 1.66 per cent at Rs 343.30; and TCS, down 1.51 per cent at Rs 2,655.10.